Cucumbers galore this week! Summer squash continue as well. The newbies this week are tomatoes and red torpedo onions. Chard is back along with beets. Basil needed to get chopped so you got a long big bunch, along with a head of fresh garlic for those who want to pesto it up. Two heads of lettuce fill the salad bowl this week. The red torpedo onions are great for any red onion task you may ask of them, as well as grilling. Their tops are fine to use as well. Aren’t they pretty? I’ve realized that the fresh garlic is less potent than cured garlic, so use more than you would normally use. The basil has some tough stems and flowers so you’ll need to go through it to get the good tender leaves off. The tomatoes are coming out of the hoophouse right now. There is the slicer “New Girl” which are the regular red round ones, and then three heirlooms — “Black Krim” is pink/green/purple, “Vintage Wine” is red and yellow striped, and “Old German” is yellow/orange/red. So far I’m pretty happy with all of their flavors. You may notice that I’m harvesting some of them a little on the firm side. This is so that they can travel from the harvest bin into your bag and back home with you without disintegrating into a mushy mess. If your tomato is a bit firm and you want it fully fully ripe, just leave it on the counter for a day or two and it will get there. But leave it too long and it will start melting and turn into a fruit fly feast so watch out. Tomatoes keep their flavor better when kept at room temperature instead of the fridge. But if they are getting past their expiration date or you want them to last for a while, I’d put em in the fridge anyway. It’s an exciting time of year when tomatoes start coming on! Caprese salad and bruschetta time! Some of you may be wondering why you’re getting cucumbers and zucchini/squash in every share now. I have an answer for you: they have to be picked at least 2-3x/week in order for them to keep producing well. And yes they do continue throughout the summer. I try to vary the contents of each week’s share as much as possible so you don’t get sick of things, but some crops such as the cucumbers and summer squash must be picked! If I get a big restaurant order of either I may leave them out here and there, but in general, you can expect to be receiving at least some each week through September or so. Della has found some more recipes to help you use them at the bottom of this blog post. What goodies are coming down the pipe you ask? Well, let’s see here… romano beans, more tomatoes, more onions, fingerling potatoes, and eggplant are probably on tap for next week. Celery will probably make another appearance fairly soon as well. What else is going on at the farm? Garlic harvesting is underway. 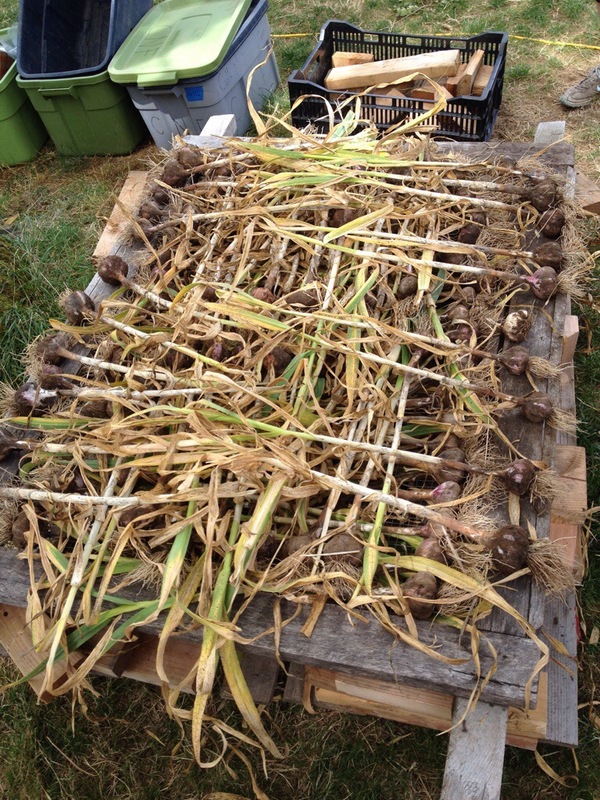 We pull out the bulbs with stalks attached and have laid them out to dry on screens in the shade as you see here. If rain threatens they will be covered or moved inside. After about 2 weeks they will be fully cured and ready for cleaning and storage. Combine all ingredients in a food processor or blender and pulse until smooth. Serve immediately, or store in the refrigerator in an air-tight container for up to 3 days. 1. Make Marinade: Combine garlic, herbs, chile flake, lemon juce and zest, and vinegar in a mixing bowl. Whisk in oil. 3. Preheat grill to high. Remove zucchini and squash from marinade and skewer. 4. Cut unpeeled onions in half and place on grill, turning occasionally. Allow to char on outside. Remove and place into a bowl, covered with plastic wrap to steam. 5. Grill skewers until tender, 5-6 minutes total, turning occasionally. 6. Peel and slice onions. Pull zucchini and squash off skewers, toss with onion, season with salt and pepper. Serve. Combine ingredients, drizzle with olive oil and lemon juice, then salt & pepper to taste. For a greener salad add some fresh lettuce or basil!